Here is another Twin Killer Sudoku puzzle for you! Remember… it’s a 2 in 1 Killer, but with no overlapping regions! Instead… The Rules: Solve the puzzle so that the left half and the right half have the same solution. Other than that, the usual Killer Sudoku rules apply. I’ve previously posted more puzzles like this one… for example, I’ve also posted a Twin Zero Killer Sudoku! 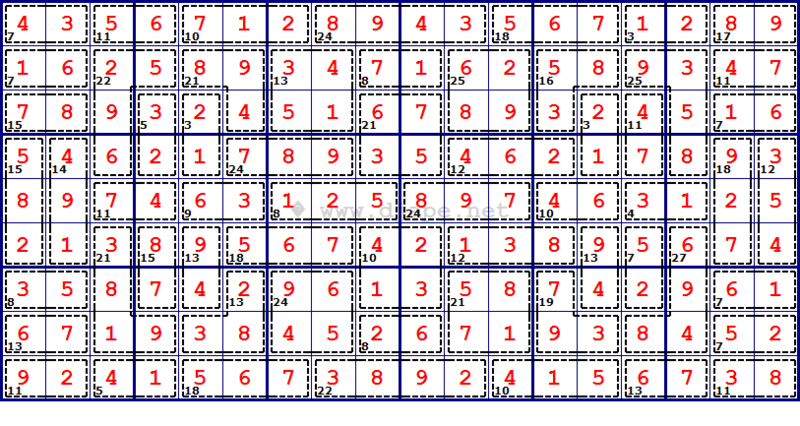 PDF Version of this puzzle: Twin Killer Sudoku PDF. This entry was posted in Free sample puzzles, Killer Sudoku and tagged killer. Bookmark the permalink. Post a comment or leave a trackback: Trackback URL. There has not been a new puzzle on here for months. Are you still updating? I’m looking for Killer Sudoku puzzles where some of the grid is not covered by cages; they’re simply left blank, for the solver to figure out. I want just Killer Sudoku, no other variant or rules. Do you make any Killer Sudoku like that? Thanks! Jerry, what you are looking for is called Zero Killer Sudoku. There is also a book with nothing but Zero Killer puzzles.